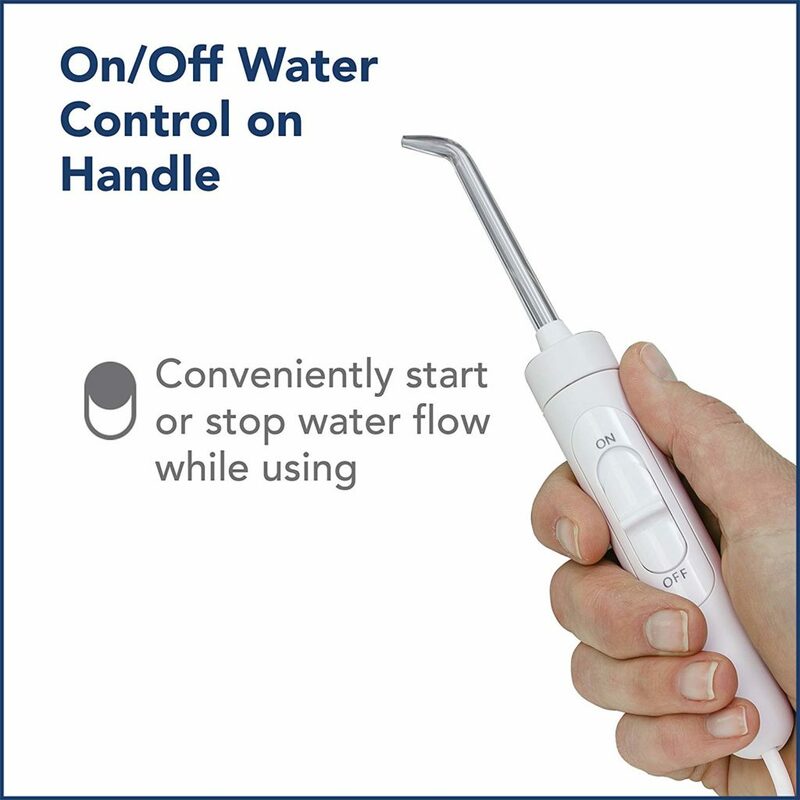 Waterpik’s Complete Care 9.0 is a water flosser and toothbrush combo that is designed to be an all-in-one solution for all of your dental care needs. 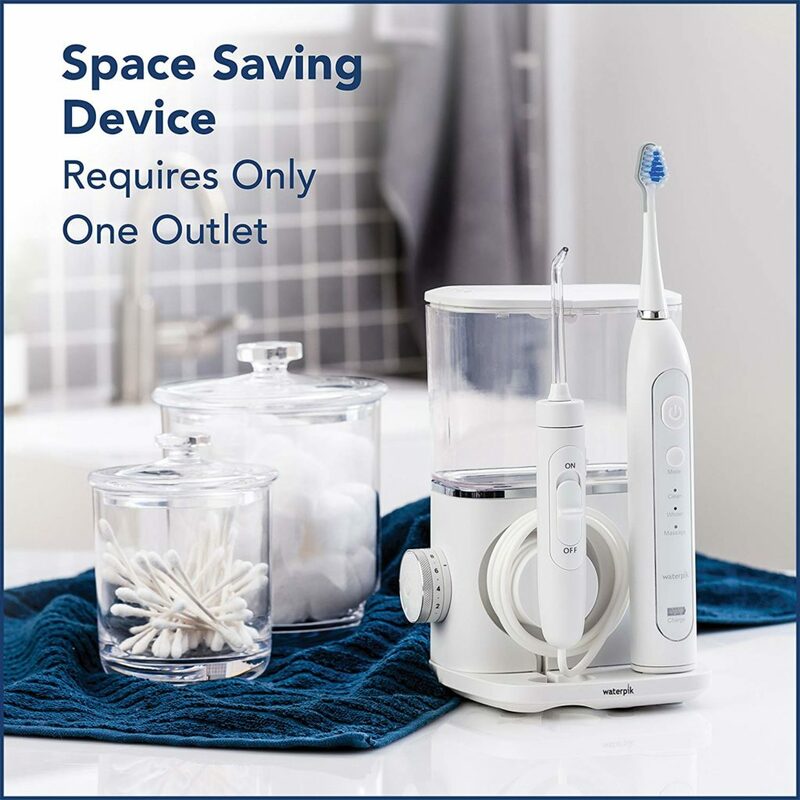 It features a Sonic Toothbrush that has three useful cleaning modes that will give you a brushing experience like never before, as well as a powerful water flosser that will eliminate food debris and plaque along your gumline that brushing alone can miss. 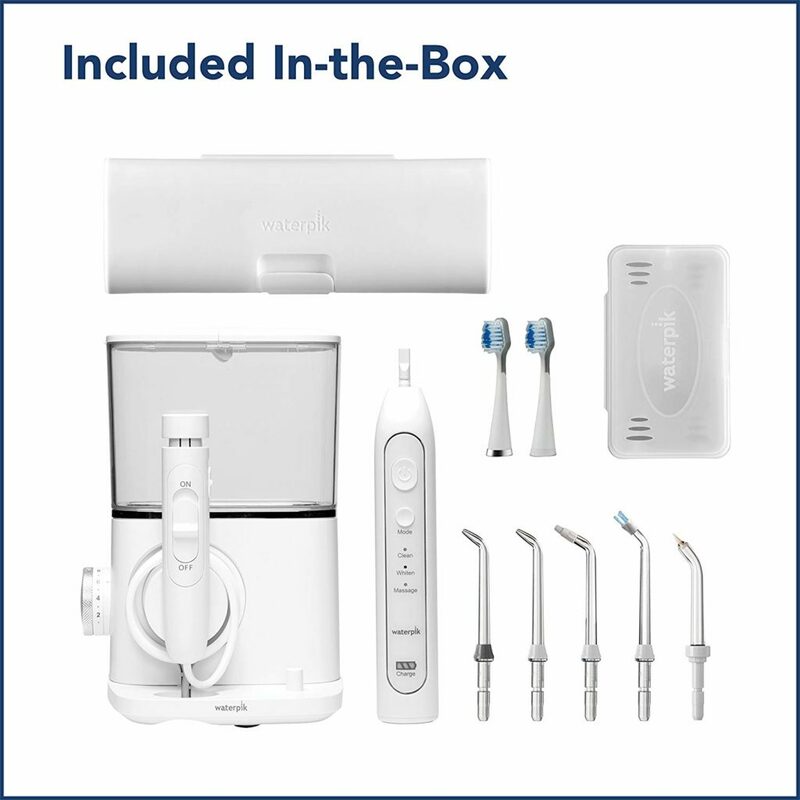 If you are looking to drastically improve your oral health, and all you have is a regular toothbrush and dental floss, Waterpik’s Complete Care series features some of the best bang-for-your-buck, combination products that can get you started such as the Complete Care 5.0 WP-861W, Complete Care 7.0 WP-950, and of course the Complete Care 9.0 which you are currently reading about. One of the biggest differences between the Complete Care 9.0 and the other Complete Care systems is its smaller footprint, which saves countertop space. 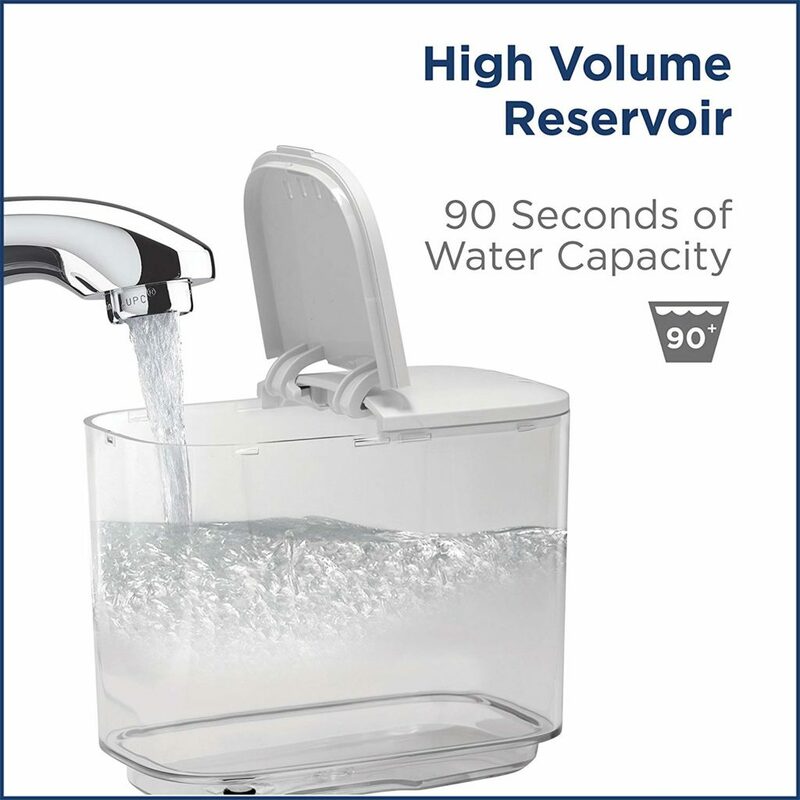 This also means that the water reservoir has been reduced in size slightly, however it can still hold plenty of water to give you a full 90 seconds of continuous flossing at the highest pressure settings (the recommended flossing time is only one minute). Another difference is the included electronic toothbrush, the Triple Sonic Toothbrush. This device features three brushing modes: Clean, Whiten, and Massage. Clean is the standard mode you use for general-purpose cleaning. Whiten is also used for cleaning but also polishing. Lastly, Massage pulsates gently for relaxing gum stimulation that will increase blood flow to that area. The included toothbrush has a quad-timer, which means it will vibrate every 30 seconds to indicate it is time to clean another quadrant of your mouth. After two minutes have elapsed, the device will turn off by itself. This is useful to help users pace themselves, so that you do not spend too much or too little time cleaning a single area. Looking at the overall product, it looks sleeker and more compact that its predecessors because of its efficient design. 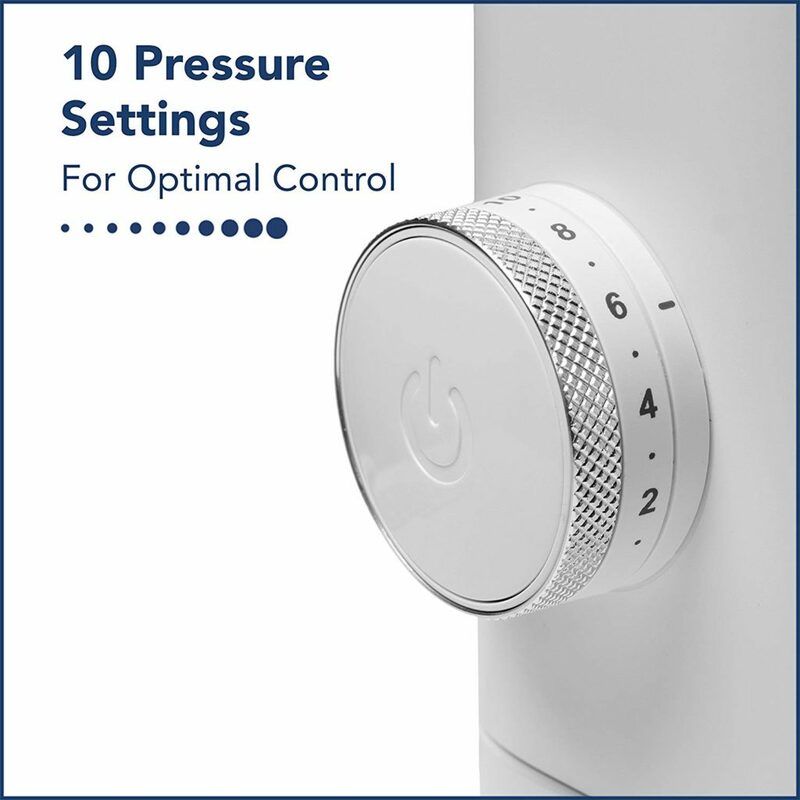 One way that the Complete Care 9.0 saves spaces is by combining the pressure dial with the power button. On older models, there was a separate switch for the pressure settings and the power on/off switch. Now, pressing on the pressure dial turns the device on and off. Furthermore, you still get the choice of 10 pressure settings to choose from like most of Waterpik’s countertop models. It is recommended that you start on pressure level 1, which has a PSI of 10, if you’ve never used a water flosser before. If max power is more your thing, pressure level 10 goes up to 100 PSI and should only be used for the toughest plaque and debris. Just how long can you expect to floss when you’re flossing at 100 PSI? A full tank holds 650 mL of water, which can let you floss for over 90 seconds. If you lower the pressure setting to something like a 6-7 (which we found was the sweet spot), then you can get even more flossing time out of your device. The hinged lid allows you to fill water without completely removing the lid, which is a nice quality of life improvement. Though the lid will keep dust and debris out of your water reservoir, water deposits can still accumulate in your unit, especially if there is high mineral content in your water. If you do not clean the entire unit frequently, we found that it can decrease the performance of the Complete Care 9.0. You can place the water reservoir in the top-rack of your dishwasher to clean it. Moving on, the flosser handle is what you’ll be using to water floss your teeth with. Located on the handle itself is the pause slider, which you can use to conveniently start or stop the flow of water without turning the device off. There is an eject button on the side to remove the flosser tip when you are done water flossing. The pause slider can be somewhat clunky to use because it does not slide smoothly all the time, especially when it is wet and hard to get a grip on. The Complete Care 9.0 comes with five flosser tips to enhance your flossing experience. Two of them are the Classic Jet Tips that are great for general purpose cleaning and are included with all Waterpik products. The Plaque Seeker tip has bristles on the end that you can use to brush your teeth as you floss. The Orthodontic Tip is designed to scrub braces squeaky clean. Lastly, the Orthodontic Tip must be used on the lowest pressure settings, and you place the soft tip into periodontal pockets to administer water or anti-bacterial solutions. Finally, the included tip storage case and premium toothbrush case provides protection for when you want to bring your water flosser with you on a trip. You won’t need to get separate bags or worry about them getting damaged anymore. One negative we have to point out is the battery on the Triple Sonic toothbrush. Its battery type is NiMH which cannot be left in to charge overnight. It can overcharge and decrease its battery life. You must remove it from the charging base once it has reached full charge. The charge indicator can help you determine this easily. A full charge can last a full week of typical use (brushing two minutes, twice daily). Once the toothbrush has no more power, you must charge it for at least an hour before it is operational again. If you are someone who travels abroad often and intends on bringing their water flosser with them, beware that this device does not have global voltage. It is intended for use only within North America, and plugging it into any other outlet can damage the unit irreparably. Is the Waterpik Complete Care 9.0 CC-01 Worth It? If you are looking to get improve your dental health by water flossing and brushing with an electric toothbrush, it is hard to beat the value provided by Waterpik’s Complete Care series. 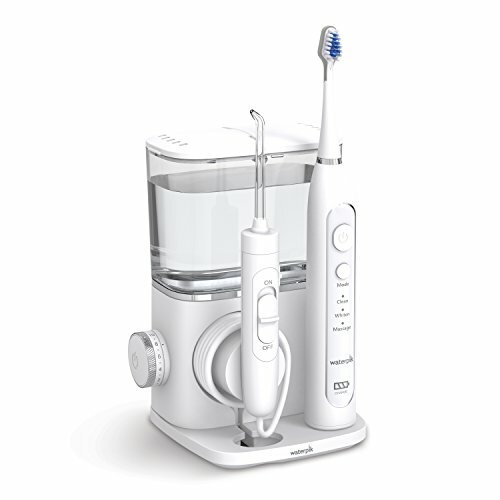 The Complete Care 9.0 is an updated model that provides some premium features such as extra modes on its Triple Sonic toothbrush. 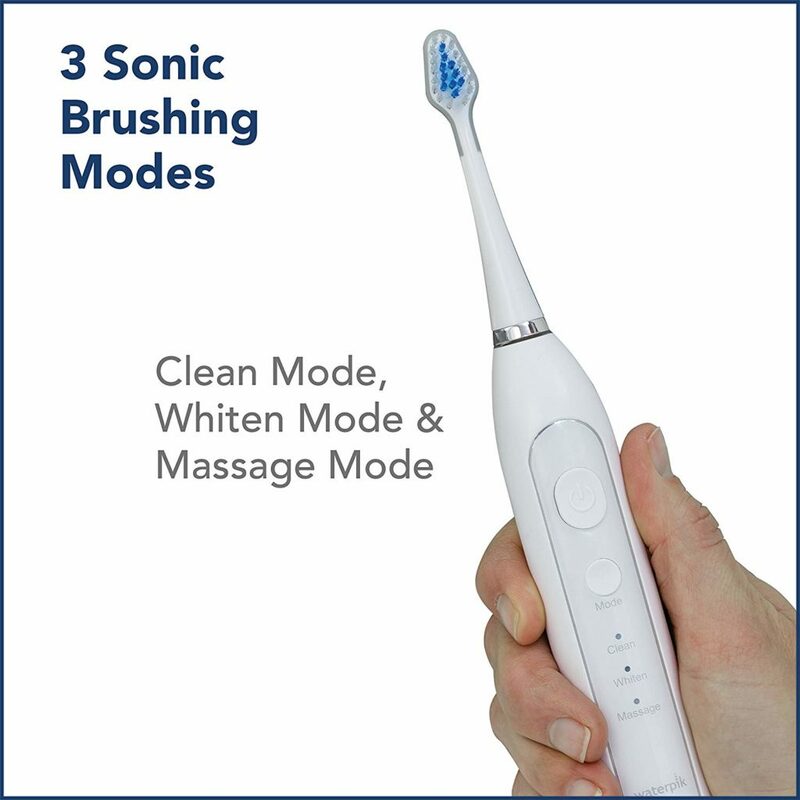 These modes, however, can be quite gimmicky and it is questionable if they can provide your teeth with better cleaning power over the default brushing mode. The biggest benefit of getting the Complete Care 9.0 CC-01 over any of the previous models in the Complete Care series is the smaller footprint on your countertop. If you are not interested in any of these features but would still like to get a great deal on a water flosser and electric toothbrush combo, we recommend you check out the older models such as the Complete Care 7.0 WP-950, Complete Care 5.0 WP-861W or even the Complete Care WP-900.